Hey Guys, Its that time of the year again where everyone goes crazy trying to find the perfect gifts. Today I will share some tips, websites, and stores that might help save some cash during this season of madness. Probably everyone has heard of black friday(November 29) and cyber monday(december 2). It's still a few weeks before then but places have already started with sales and deals. 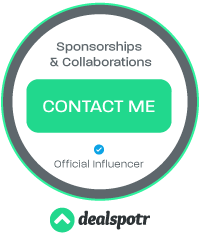 ebates- A place to get cash back from many many stores with extra cash back starting now. But it's not actually a store. QVC, is a tv channel that has great deals that can also be accessed online. They have all kinds of products like gift sets and home decor at reasonable to expensive prices. When this product first came out I expected it to be amazing! I bought the waterproof version and it smeared and smudged all over my eyes, on the lid and all under my eyes. It didn't give me very much volume or anything. I don't even have it anymore because I hated it so much. By now you can probably tell that I love my lip products, especially stains and jumbo pencils. A few weeks ago I went to my first Walgreens, where they carry Jordana products. I heard these are just as good as the Revlon just bitten kissable balm stains, but I only bought one to put to the test. These are very affordable, only about $3! thats less than half the price of the Revlon version. 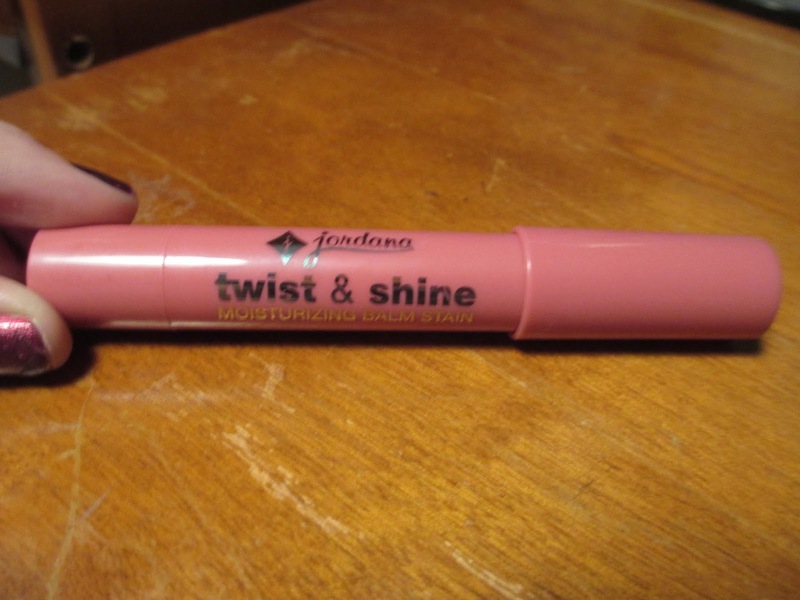 I do not own the Revlon ones, so this is just a review on the Jordana. The packaging is very simple, shiny, and it is a twist up like the name applies. As you can see the color looks like the outside of the tube. I have the second shade, 02 sweet pink. Here is the color on my lips, it is a lot brighter than in the tube, more of a fuschia. And it does stain, hence the top at my cupids bow that would not come off. Here is a very light swatch above a layered swatch. 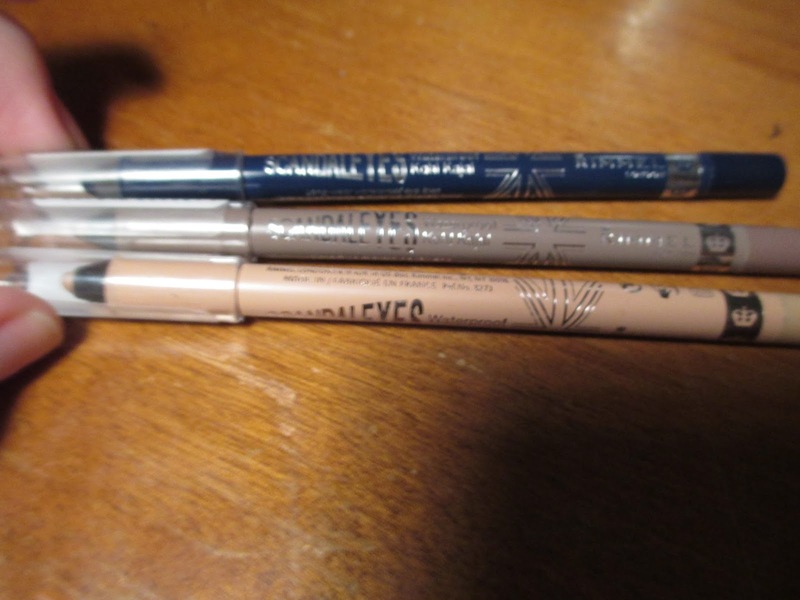 Here are the swatches after makeup remover, as you can see both hold up very well. 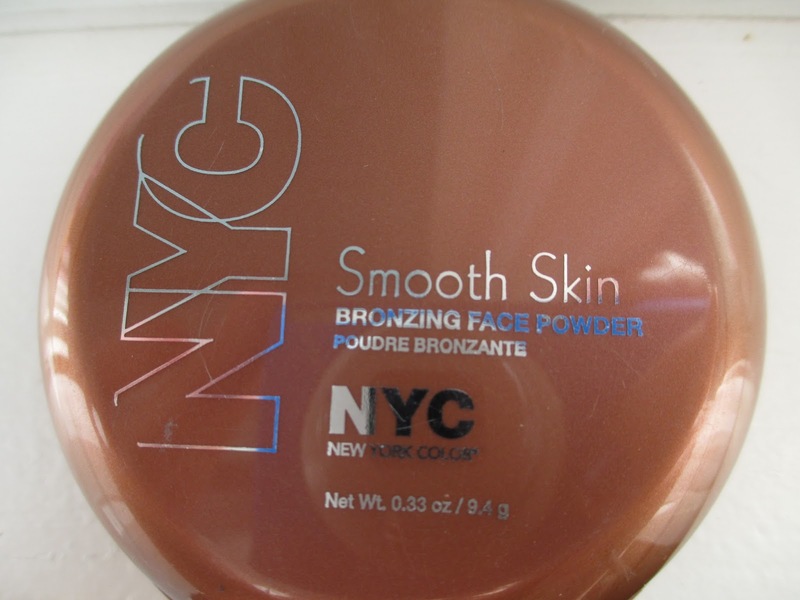 Today's review is on the infamous NYC sunny bronzer. it's available in most drugstores for around $3. The packaging is a shiny coppery color with silver wording. It's very light weight and portable. On the back it tells you more about it. The inside has a large mirror, a sponge(very very thin) and a plastic layer before you get to the bronzer. Here is what the color looks like on my finger, it appears pigmented a lovely medium brown color. Swatched it is very orangey and not nearly as pigmented, but very silky. Reccomend? Not sure if I would if you hav pale skin if you are more beige or dark then maybe. It's time to sparkle and shine! 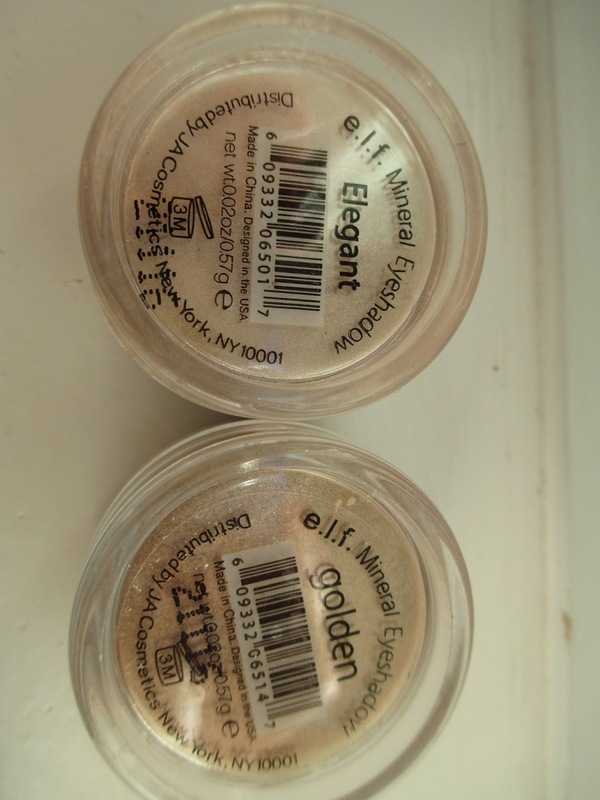 Today I'm reviewing the elf mineral eyeshadows in two colors. These are $3 each sold on the elf website and in select stores. The shades I own are Elegant and Golden. The bottom is clear where you can see the color and the name. The top just says "elf eyeshadow", I bought mine in a kit so I don't know if this is the regular packaging. There are only a few large hole so the product does tend to come out quickly so make sure to open carefully and slowly. And just use the product in the lid . Here are some swatches, golden on the left, elegant on the right. 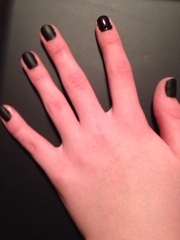 Black nail polish is a wonderful staple in any nail polish collection. For Halloween I decided to add two coats of Pure Ice Black Out topped with opi matte top coat( NYC makes a matte top coat as well) and wet n wild Night prowl on accent( cream black nail polish with purple shimmer). Of course you could take this a step further and add decals or designs. I just don't have the time plus this look will be nice looking even after Halloween.